Consistently ranked as one of the best walking cities in the US, Philadelphia follows a grid system (like NYC) which makes it very easy to navigate the streets and get around the city. The north/south streets are numbered and the east/west streets have tree names (e.g., Walnut, Spruce, Pine). In addition, the proximity of Penn’s campus to areas around or within the compact city center make it easy to explore the many shops, museums, green spaces, galleries and restaurants. Curb cut-outs also make the city wheelchair accessible. Walking at a casual pace to Rittenhouse Square from Penn’s Campus takes between 30-40 minutes at most. Philly is also incredibly biker friendly. Philly’s bike-share program, Indego, offers monthly memberships. It has bike stalls commonly located across the city, and the closest one is on 36th street and Sansom, right next to the Penn Book’s store. Do remember to wear a helmet when you are biking. Perhaps one of the most convenient and underused transportation option is the Penn Bus. They run are mostly within campus but some even go into center city. They are free with your University ID, and the detailed maps and schedules can be found on the Penn Transportation and Parking website. SEPTA is the regional public transportation that operates subways, bus, trolley, and regional rails in Philly. You can purchase tickets or key cards at the fare kiosks located in transit stations and at bus stops. 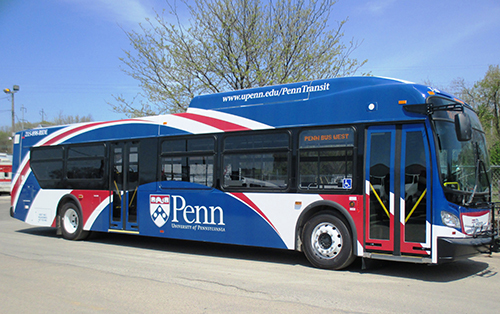 There are multiple stops right on Penn’s campus. You can simply hop on and arrive in center city by subway or bus in 15 minutes. For a short ride, it is quite convenient to use Uber or Lyft in Philly. Taxis are less common and it may take longer time to find a taxi unless you are at the train station or the airpot. SEPTA Regional Rail is a convenient and affordable option to travel to close by areas such as New Jersey and Delaware. You can also travel by train. While the tickets are more expensive than those of buses, Amtrak trains adhere to a more reliable timetable. The train station is located at eh 30th Street Station, which is about a half hour walk or 10-minute drive from Penn’s main campus. Here are some of the airports closest to Penn. The Undergraduate Assembly and other student groups often have airport pick up or shuttle services at the beginning/end of break. Be aware of weather conditions and plan ahead when flights are delayed or cancelled. In the U.S. you’d need to get a learner’s permit and then get your license. As international students, it also requires a number of documents. For all the requirements and driver’s license centers in Philly, please refer to Penndot. In the rare events that you need to drive around Philly, whether for move in/move out, long weekend outings, or other occasions, you could consider renting a car. A convenient way to rent a car in Philly by hour/day is through zipcar. Check out more info here. Or, you can always go to car rental companies such as Hertz, Avis, and Enterprise. However, be sure to check individual company policies, as they often have a age requirement of 20 or 21 years old and have a “young renter” extra fee for anyone under 25. Q: How long did it for you to find your ways around campus and around Philly? Q: What are some transportation you use the most when you leave campus? Q: Have you driven in the US and do you have experience with getting a driver’s license in Philly? Q: What advice would you have for any newcomer to Penn and Philly regarding transportation? “1. Although it’s expensive, I would recommend getting an Uber account if they don’t already have one. Most of the time, I travel with friends anyways so we always end up splitting and sometimes Uber really is the most convenient way of getting around! (would also recommend getting Venmo to help with splitting costs).